Peace of mind: "Nothing good comes out of it"
by Torbjorn HobbelA Norwegian going to India to teach meditation? It sounds almost as absurd as if an Indian travelled to Norway to teach Norwegians how to ski. Yet Torbjorn Hobbel has travelled to New Delhi many times to teach Indians Acem Meditation. In this article he reflects on one of his experiences there.”Meditation is the worst thing I know.” The more than 80-year old Indian writer Khushwant Singh did not care to ingratiate himself with his visitor. He was going to interview me for the Hindustan Times. At the time, I did not know how famous he was. I thought he was just another journalist interested in the apparent paradox in a Westerner going to India to teach meditation. I soon understood that this was something more than an interview. 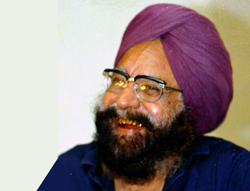 I had been granted an audience.Khushwant Singh is one of India’s superstars, a legend in his own right, a rich and famous man whose writings fill shelf upon shelf in bookstores, and whose TV pro­grammes are watched by millions. Known as a ruthless interviewer, he once characterised himself as “not a nice man to know.” After a servant had led me into his huge living room, where he sat like an old sage with his long beard and black-dyed hair, he became irritated, and complained that I was half an hour late. It turned out he had mistaken me for somebody else. Only when he heard that I came from Norway did some of the ice begin to melt: his first love had been a Norwegian girl. The interview could begin. “Meditation is the worst thing I know.” His very first comment was obviously meant to provoke me. I was a teacher of meditation, and he knew it. He continued: “Peace of mind, nothing good has come out of it!” Another attempt at provocation. But this time his comment gave me a good opportunity to present Acem’s view of meditation. Many meditation groups promise instant peace of mind. Total happi­ness, complete satisfaction,no disturbing thoughts or feelings, perfect health, no problems in life. This is the case in India as in the West. In comparison, Acem offers few promises.All important things in life demand time and interest. For some reason,however, many people have a tendency towards romantic over­simplification when it comes to spiritual matters. Although they think meditation is extremely important, they still expect fabulous results to occur almost without effort.Instead of offering such promises, Acem tries to give a down-to-earth description of the actual meditative process. Meditation will not always provide peace of mind. The free mental attitude of Acem Meditation creates an open inner space in which unfinished and unfulfilled business will enter: the children you do not pay enough attention to, the work you do not conduct in a satisfactory manner, the opportuni­ties in life you fail to make use of. Sometimes, it feels frustrating. Many meditation groups seem to say: “Life may be bad, but during meditation everything becomesfine.” As if meditation helps you to rid yourself of yourself. From Acem’s point of view, this com­pletely misses the point. In Acem Meditation, you allow a wider range of experience from your life to enter into your mind. Who are you? The actualisation of “life’s residues” within you, the awakening of something that used to be dormant, enables you to relate to your own unfinished business in an emanci­pating way, instead of being sup­pressed and repressed. In Acem Meditation, you constantly encoun­ter what appears to be distur­bances. But you yourself are the source of disturbance. The potential for further development lies not in getting rid of the disturbance, but in finding a new way to relate to it.Acem’s understanding of medita­tion is different from other medita­tive traditions that I know of, whether in the East or in the West. In Acem, the most interesting process starts when you begin to work with and modify the nuances and the quality of your own perform­ance of the technique. This requires longterm cultivation and refine­ment. The results go far beyond simple relaxation.All the pedagogical activities developed in Acem attempt to stimulate this process. The way you repeat the meditation sound is a reflection of your personality. A mirror image of your life.Relaxation and energy come as automatic results. More far-reaching effects, like personal development and self-realisation, require some­thing more. At this level, meditation is a process – or an art, perhaps – rather than just a technique, and the quality of one’s performance is of vital importance. Nobody can do it for you – it is your own work of art.The audience with Kushwant Singh was over. 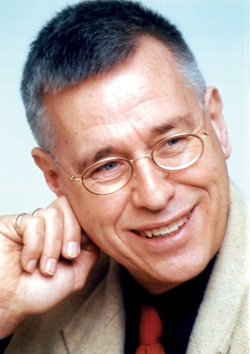 When I lecture on meditation, I often use his rather rude comments on meditation and peace of mind to convey a basic point: Acem Meditation is different.Acem International Newsletter no 2 1999 Torbjorn Hobbel, MA, is a meditation teacher in Acem. He has studied Nordic languages and literatures, history, and the history of religion at the University of Oslo. Here in Acem India, which he founded in 1998. Do I have a superficial understanding or is the goal not to become a good meditator— but to use this marvelous tool as a vehicle for letting go of one’s monkey mind and connecting with a deeper reality and thereby benefiting oneself as well as those around us. As long as the method helps decrease the tyranny of the ego, I imagine it is beneficial. very interesting and intriguing point of view has been provided in this article. And as author pointed it out we (Indians specifically) do have romanticized perceptions about Meditation and other spiritual activities to make us reach to a particular state where everything would be perfect for us, but that’s changing now and people are practicing meditation from realistic viewpoint. There are many forms or ways of meditation which have been developed over the years since a vedic period. It was developed according to the need of a particular section of people. It doesn’t matter what way or form one accepts as long as it’s giving him/her peace of mind and happiness which is the ultimate aim of meditation. If it’s not, then either the way is wrong or the person is not doing it correctly.